4/19/06 NOTE: For Seem Edits, Motorola's Software Update (aka MSU) can be substituted for PST, and is available LEGALLY... see -> Using Motorola's Software Update program (aka MSU) instead of PST (it includes a link to download MSU.) IF you use the link about using MSU, you do not need to obtain PST or follow the PREP-WORK section to do seem edits. 3. 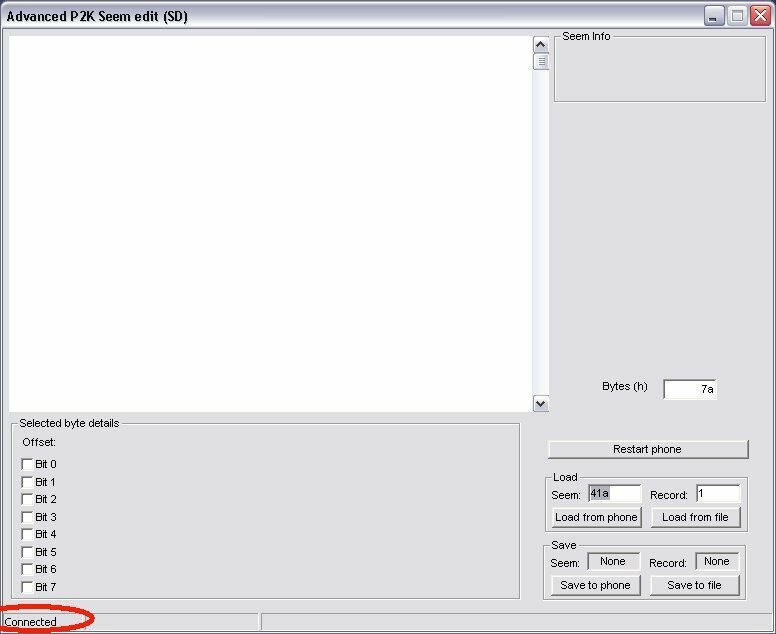 Install and configure PST and its drivers, along with testing its connection (Formerly known as the Prep-work section of the Seem Edit page). 5. Seem Number, Bytes (h), Record Number, Offset and Bit that you wish to change. Seem edits can NOT be done over bluetooth! Seem edits can NOT be done on a MAC..
You must have a Windows 2000 or Windows XP PC and USB Data cable. Please see the additional notes on USB Data cables see the info on the FAQ page!! NOTE: Click on any of the pictures below to see the "full screen" shot. 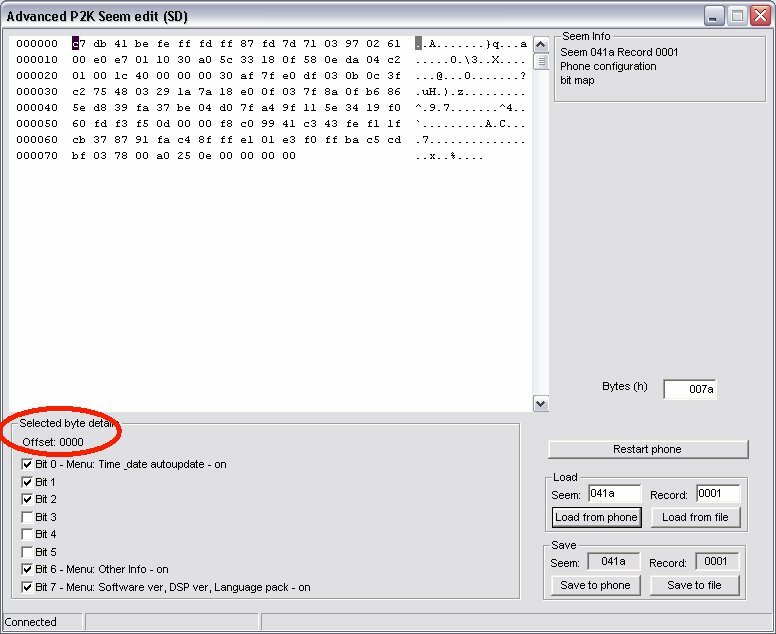 NOTE: This process can be used for ANY Seem edit where you have the Seem Number, Bytes in Hex (aka length), record number and bits you need to change. UPDATE: For Bytes (h) value... 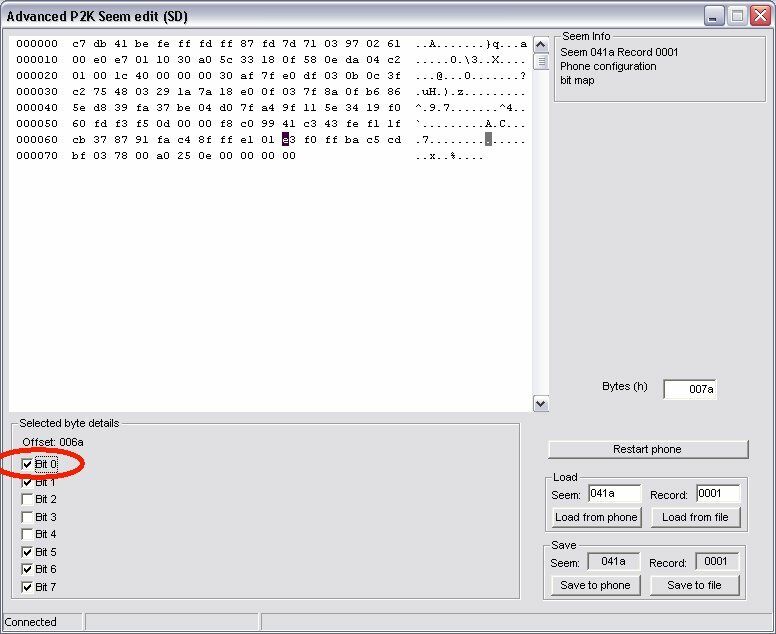 Entering 0000 as the Bytes (h) value causes P2KSeem for V710 to load the entire seem file (all offsets) from the phone. 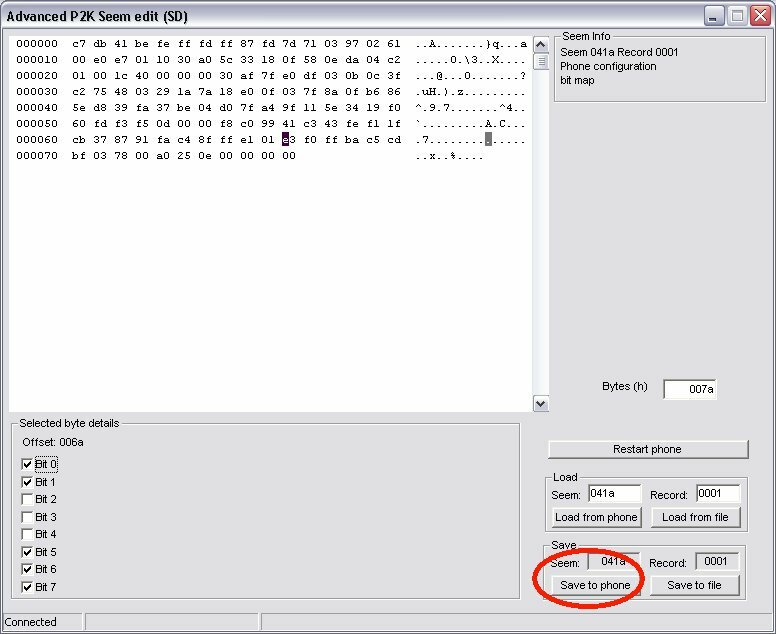 In the past, we'd enter a number (in hex) such as 7A or 90, which tells P2KSeem for V710 to load that range or only a subset/section of offset data. 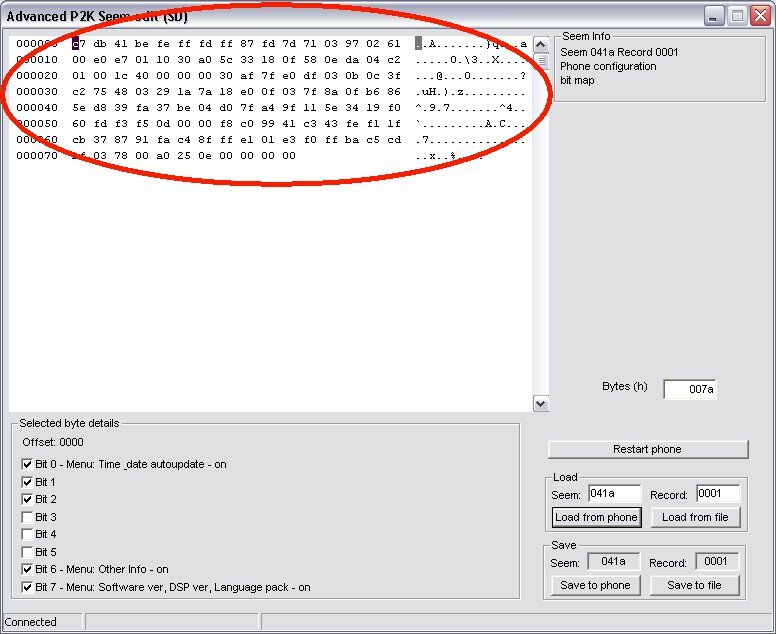 The example used in this walk through is to "Enable Bluetooth Or USB file transfer in MPT" on the V710 (V265 and V325)... As such, we will be using the following values.... Bytes = 7A, Seem = 041A, and Record =1... For Offset 6A we will be setting Bit 0 = 1 or Enabled or "Checking the box." If you wish to do this edit on the E815 or V3C or V3M or KRZR K1M, replace 041A in the "seem" box with 2742. Launch MSU OR PST Phone Programmer. With MSU or PST Phone Programmer still running, to execute P2KSeem for V710, just double click the P2KSEEM.EXE from the folder you extracted the files to earlier. P2KSeem for V710 should say "connected" in the lower left. 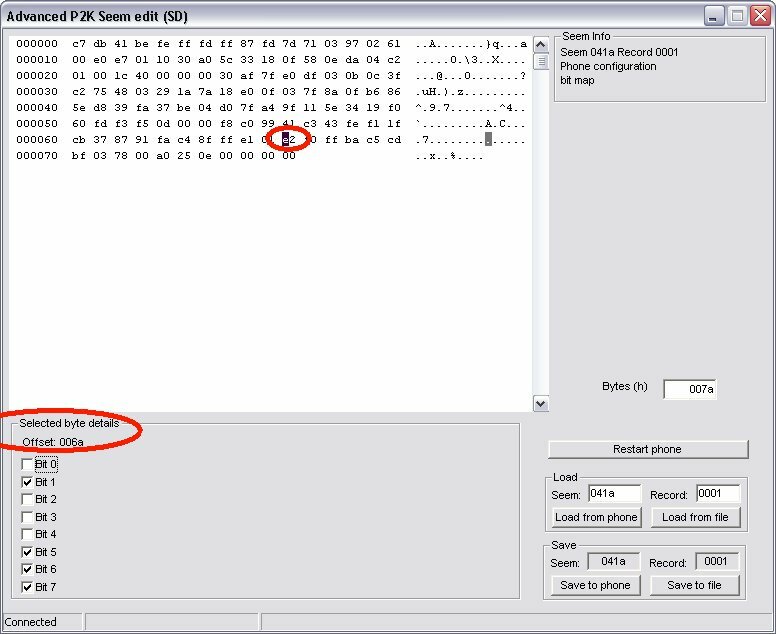 For me, P2KSeem for V710 launches with Byte field fill in as 7a (hex) and the the Load Seem filled in as 041A. Please change the values for Seem Number, Bytes (h), and Record Number as needed for the Phone and Seem Edit you wish to make!! Failure to do so could cause problems ranging from P2KSeem just not reading the seem from the phone, to totally messing up your phone!! 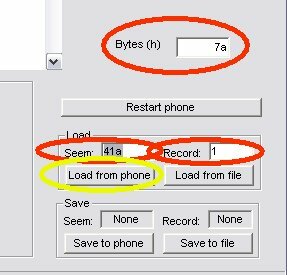 For this example (Moto V710 phone), in the LOAD area we fill in Bytes (h) as 7A, Seem as 041a, and Record as 1. Once they are filled in correctly, Click the LOAD FROM PHONE button. You will see a bunch of "junk" (really its hex codes, etc) in the top part of the window. We need to get to offset 6A bit 0, so use the arrows to move the cursor until OFFSET reads 006A (Hint: use the DOWN ARROW on PC the keyboard 6 times to get to Line 000060, then use the RIGHT ARROW on the PC keyboard 20 times to get to offset 006A). Click on the box for BIT 0 to put a check mark in it. That sets BIT0 = 1(in this case, enabled) Note: A check mark in the box means the value for that bit is set to 1. No check mark in the box means the value for that bit is set to 0. Click the SAVE TO PHONE button in the lower right. NOTE: E815 users with 01.17.03 firmware may need to re-enable Dial-Up Networking on their phones after doing seem edits by entering ##DIALUP on the keypad. To Verify your seem edits were saved... with all applications on the PC Exited... Launch PST... then P2kSeem for V710... if it says Connected, In the LOAD area, fill in the Seem number and Record and bytes value. Once they are filled in correctly, Click the LOAD FROM PHONE button. You should see some "junk" (actually HEX codes) in the top window... Use the PC Keyboard's arrow keys to move around and find the appropriate offset, and take a look at the boxes for the bits. Are they Checked/Unchecked the way you wanted? If so, the seem edit was saved. GoldMembr's EDITED 2742 Seem (90h bytes) Too many edits to list here :) see -> THIS POST for details. GoldMembr's EDITED 2742 Seem (0000h bytes) using 0000h bytes loads the ENTIRE Seem file, not just a sub section. see -> THIS POST for details.